In the East rather in India, we have a beautiful proverb: The man who loses the path in the morning, if he returns home by the evening he should not be called lost(Subah Ka Bhoola Agar Saanj Ko Ghar Laut Aaye Toh Woh Bhoola Nahi Kahalata Hai). What does it matter? In the morning he went astray -- just little adventures here and there -- and by the evening he is back home. A few people may have come a little earlier; he has come a little late, but he is not necessarily poorer than those who have come earlier. It may be just vice versa: he may be more experienced. He has known more because he has wandered more; he has known more because he has committed more mistakes. He is much more mature and experienced because he has gone wandering so far astray. And then coming back again, falling and getting up... he is not necessarily a loser. So time is not at all a consideration to me, if you are returning! The sooner will be better and even better will be late than never. Dipikaji...You are Baba's child. HE is always with you. HE will surely get you a good job soon. Just wait and see. And know that everytime you do so, HE has forgiven you. Baba has already forgiven you ! Baba, please forgive me for my sins and thanks for showing us light at end of tunnel. We your bhaktas need your blessing and support. 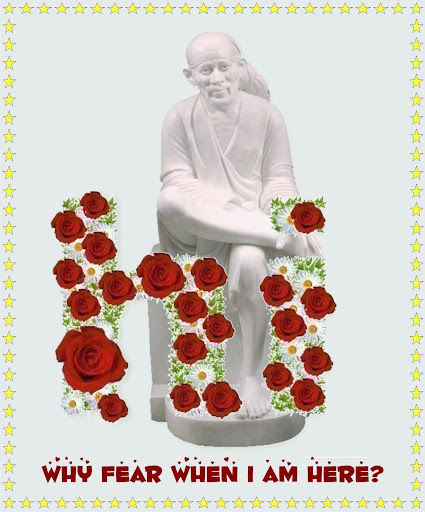 Baba please help us to overcome our difficult times and also bless everyone. I know Baba that you are there with me always, Baba please let us bow at your feet and please end all of my ego, desires, fear and restore peace in our mind and heart. Baba please forgive us for our ignorance and not knowing anything. As your child please guide us through this times. Although this may be difficult but I know you are doing this for making us to go on proper path and be good persons. Baba we are nothing Baba please hold our hand. Baba though there is lot of things that we have achieved but it appears useless . Baba please burn down my ego and let me love and respect everyone and please guide me Baba without your wish nothing is possible. Please accept my head on your feet. Hope u enjoy your stay with all of us. Welcome, dear Mihir, to our inline SAI family. HE IS WITH YOU - ALWAYS.